In the bowl of an electric stand mixer fitted with the paddle attachment, whip together butter and sugar until combined and creamy. Mix in egg and vanilla and beat until smooth, scraping down the bowl. Whisk together the flour and lemon rind in a bowl and then add to egg mixture. Mix on low until combined. Do not overmix. Form mixture into a ball and place on a sheet of plastic wrap. Flatten into a 6-inch round disk, cover with plastic wrap and chill in the refrigerator 2 hours. Heat oven to 325° F and line cookie sheets with parchment paper. Dust work surface with flour, cut disk in half and then evenly roll out each half to about 1/8 thickness. 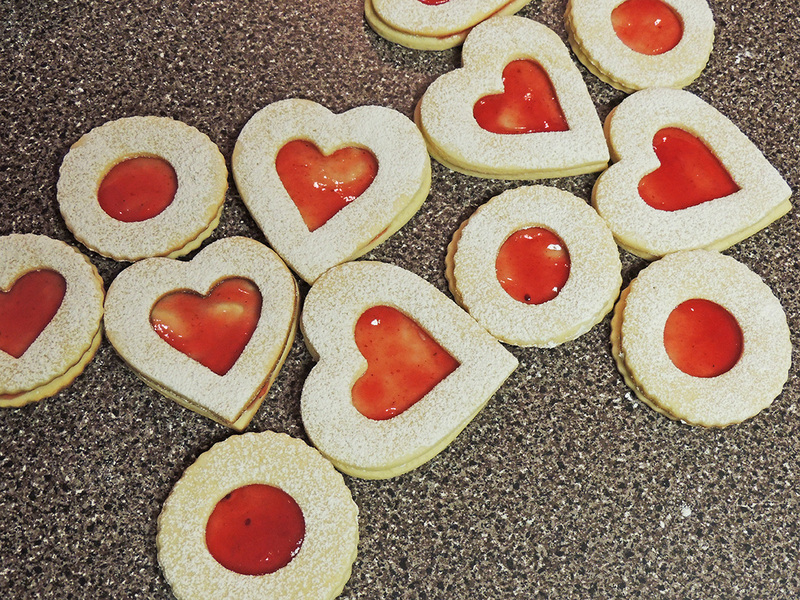 Cut into heart or round shapes using a cookie cutter, then using a smaller heart or round shape cookie cutter, cut smaller holes into the centers of half of the cookies. Carefully transfer to parchment paper lined baking sheets. Bake 10 – 12 minutes until edges are lightly golden. Cool on baking sheet several minutes then transfer to a wire rack to cool completely. Spread a layer of jelly over whole cookies. Dust the cut-out cookies with powdered sugar, then place those cookies over the jellied cookies.